On November 9, 2015 the 6th annual Baskets of Hope in support of WIN House took place at Rohit Group of Companies office. This event began in 2010 as the brainchild of Dianne Young and her friends as an opportunity to give back to the community, specifically for women facing adversity. This event quickly grew with the partnership of Krishna Gupta, VP of Rohit Group of Companies, and expanded to include business partners, community members, and family and friends that generously donate time, finances, and basket items to provide a touch of comfort and love. These community advocates brought the spirit of Christmas and Diwali together to create baskets filled with items to help make the holidays special for women in need. WIN House is a local charity that helps women and children escape abusive situations. It truly inspires effort to make the community a better place to live for many women in Edmonton. Rohit Group of Companies is proud to rally behind WIN House and the women and families they serve. 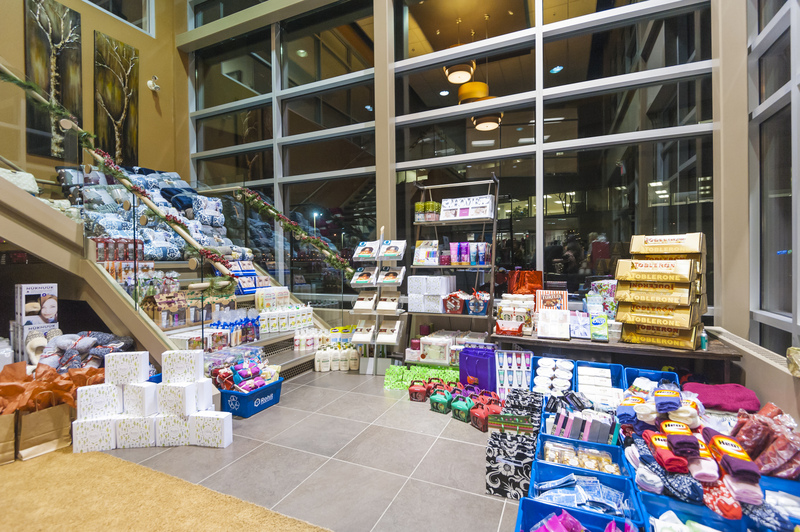 The baskets are filled with types of comfort items that people reach for on a bad day, such as chocolate, luxurious bathrobes or blankets, fine soaps, and other little luxuries. 135 baskets were delivered to WIN House this year. As a celebration of women empowering other women, Rohit Group of Companies hopes to keep this tradition alive and encourages Edmontonians to get involved and continue building a better community together. A fundraising component was added to the event this year. Over $2000 was raised for WIN House in partnership with a local fine artist, Giselle Denis. Giselle painted a large canvas at the event, valued at over $1800, which was raffled off to raise additional financial support for WIN House. Rohit Group of Companies has grown from a small home builder in Edmonton to a diversified organization with complementary interests in residential and land development, commercial assets and real estate lending. Rohit Communities, the home building division and foundation of Rohit Group of Companies, has been named Edmonton’s Multi Family Home Builder of the Year 3 times.